It’s always fascinating to see what creators can do when enabled by cutting edge technology – at Intel®, we see so many different visions of the future, powered by our technologies, but made by amazing artists, designers, developers and engineers. Because Intel® RealSense™ technologies give machines the ability to sense their environment, creators have the ability to make devices that react to changing conditions. Brixels, created by the team at BREAKFAST, is one such device – or installation, wall, display? It’s hard to describe what it is until you see it in action. BREAKFAST have created mirrored brick sized pixels (or Brixels) which can move and turn independently to create a physical, kinetic display. This display can then show simple information, such as time, temperature, or other things you might expect to see in a large display. An additional feature exists, though – by using Intel RealSense Depth Cameras, the display can also react to people in front of it. Since the pixels are two sided, with one being a mirror, and the other side being black, the resulting displayed person is a silhouette, but one that moves with them in real time. The feeling is somewhat reminiscent of someone controlling a wave of people at a stadium – moving in front of these turning bricks feels very much like playing with a living architecture. Imagine the buildings of the future, with areas of intelligent walls that can show a wide variety of information, but can also react to your presence, your movement or your gestures. A wall that could turn into a window with a wave of your hand, but a window that you decide the dimensions of, from moment to moment. Buildings that live and breathe within and with their environments; the future is not only more exciting and interesting than we imagine, but more exciting than we can imagine. 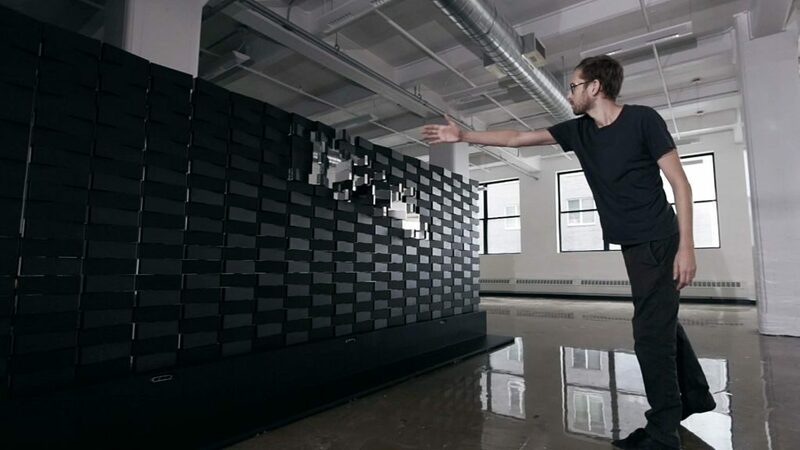 For more information on this piece, please visit the BREAKFAST page about it here (https://breakfastny.com/brixels) and watch the video below – the interactive Intel RealSense Technologies enabled portion starts at 0:20s.